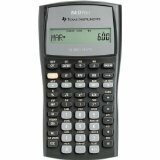 The Texas Instruments BA II Plus is an approved calculator for sitting the Institute and Faculty of Actuaries examinations. Please note that VAT will be charged to UK customers. With Time Value of Money, uneven cash flow analysis, and advanced statistics, the BA II Plus is perfect for applications in finance, accounting, economics, investment, statistics and more. Excellent mortgage calculator and loan calculator.